I'm continuing on with my rain celebration since we get so little of it lately. 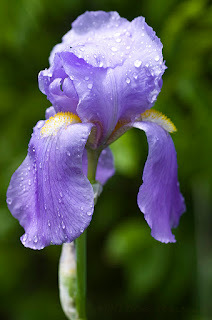 The Iris are blooming now and I got a shot of this light purple one just as the sun started to peek out after the rain on Sunday morning. Some of these purple Iris smell like grapes. Quite lovely.